The most significant news of all, NASA's latest announcement has recently incubated a string of hopes with the successful research findings of the Spitzer Space Telescope, nurturing a deliberate connection to the earth. Although this is very early to voice that an alien colony might soon be revealed, rumors, as always, strongly points to the direction. Shifting to the main content, a press release directly from NASA on February 22 confirms that a batch of seven earth-sized planets was discovered, revolving around a single star called as TRAPPIST-1. Further, three of them are said to be firmly placed in the habitable zone around the star, where the rocky planets strongly suggest to hold liquid water! With a couple of statements, NASA was able to inject a never-seen excitement among different scientific and artists' communities which now seem to propagate like a bush fire. Owing to the SST, formerly known as Space Infrared Telescope Facility launched in 2003 as the fourth and final of NASA's Great Observatories Program, NASA could get its hands on the record breaking set of habitable planets where a whopping 7 exceeded its expectation. 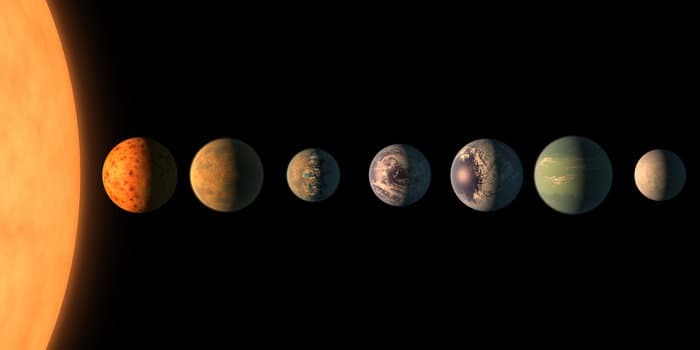 As revealed in the news, all the seven planets can potentially conceive liquid water, the source of life but only when certain atmospheric conditions are met but the three have the greatest chance that fits strongly in the habitable zone. Thomas Zurbuchen, associate administrator of the agency's Science Mission Directorate in Washington, clearly implied that the discovery would solve the millennium puzzle of habitable zone responsive to lives. According to Sara Seager, an expert in physics and Planetary science at MIT, this revelation was a giant leap forward in search of habitable zones where she highlighted the number of planets falling in the Goldilocks zone (Habitable zone) and called them the sister planets. The TRAPPIST-1 system belongs to the Aquarius constellation, having a distance of 40 light years (235 trillion miles from Earth). 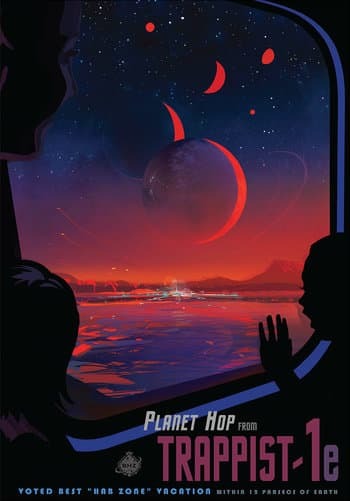 Named after The Transiting Planets and Planetesimals Small Telescope (TRAPPIST) the exoplanet system with only 3 of those planets were discovered in May 2016 by TRAPPIST. Later, Spitzer confirmed the existence of two of those planets and discovered 5 more in the system. Using Spitzer data, the size of the 7 planets were calculated and information related to 6 of their masses were measured, divulging their densities. Doesn't It Look Like Our Solar System? unveiled that the research is the first of its kind and will not only strengthen our understanding of habitable planets but also will disclose valuable information regarding its atmosphere. 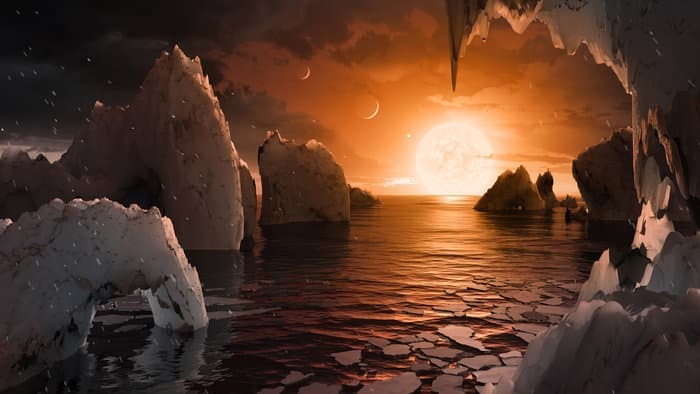 The story published by NASA is no stranger than any modern sci-fi, where the TRAPPIST-1 star is tagged as an ultra-cool dwarf and the seven planets moving in very close proximity to the star. The distance is so less that all the 7 planets fit in the distance which is lower than the distance between Mercury and our Sun. As one can comprehend, this suggests that the planets are placed very close to each other. Hypothetically, if one could visit the sky from one of those planets he could notice clouds on the neighbor planets. Further, the planets seem to be tidally locked to TRAPPIST-1 which means they do not experience earth like day-night experience and weather. After May, 2009 the primary features of Spitzer were terminated due to the exhausted fuel but two of its shortest-wavelength modules of the IRAC camera were operable and that prompted to Spitzer Warm Mission that finally bore fruit with the latest discovery. In 2016, Spitzer grabbed the opportunity to observe TRAPPIST-1 nearly continuously for 500 hours gifting Earth the most valuable result in the 14 years of its life. As Sean Carey, manager of NASA's Spitzer Science Center at Caltech/IPAC in Pasadena, CA revealed, Spitzer will again contact in fall,2017 leaking many crucial secrets which would be judged by James Webb Telescope. After the bold revelation by Spitzer, Hubble telescope initiated its process to study if those planets had the existence of puffy, hydrogen-dominated atmospheres and found none, validating the rocky nature of those planets. NASA's Kepler Space Telescope is also studying the star's minuscule changes in brightness owing to the transiting planets. As the source reveals, Spitzer, Hubble, and Kepler jointly with James Webb Space Telescope, to be launched in 2018 will dig deeper to search for the chemical fingerprints of water, methane, oxygen, ozone, and various other components that can optimistically build a bridge between human knowledge of habitable planets and the reality. The complete research report was published in Nature on Wednesday. Leaving this scientific jargon behind, now you can experience the world of habitable exoplanets using "Eyes on Exopalanets" desktop application and take a plunge into the scientifically accurate 3D universe. Also, based upon your interest in finding the one, TRAPPIST-1, in the atlas of exoplanet systems, you can visit it with thousand other discovered till now. So, what are you waiting for? Jump in and be a part of the real Star-wars environment.